Napoleon was a lot of things, but modest wasn’t one of them. This is something no better proved than that time he responded to being declared Emperor of the French by planning an elaborate ceremony that would see him stroll around wearing an 80 pound (37 kg) cape… No, that isn’t a typo. 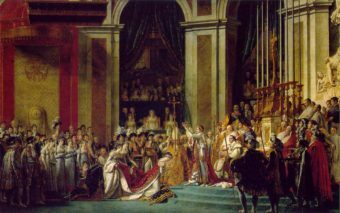 Although Napoleon was formally declared Emperor of the French by the Senate on May 18, 1804, his coronation wouldn’t actually take place until December of that year, which is kind of understandable when you realise just how impossibly opulent the event itself was. So hotly anticipated was the event that many people turned up to the cathedral the day before, dutifully waiting outside for a chance to watch the procession. Despite the fact that Napoleon himself wouldn’t arrive until around noon, the doors to the cathedral itself ultimately opened at 6AM the next morning, around which point the air of Paris was filled with the sound of thundering cannon fire. The purpose of the cannon fire, beyond no doubt terrifying local birds, was to wake Napoleon who was asleep in a giant, opulent bed. He soon adorned himself in white satin underwear covered in gold embroidery, silk stockings, dressing gown, tunic, cape and sword. As for the latter, he had the weapon accessorised with a giant diamond attached to its pommel. Well apparently Raguineau had once advised Napoleon’s wife, Joséphine, not to marry Napoleon as he was a man “who has nothing but a cape and a sword”- a statement Napoleon had evidently taken great offence to and wanted to take the chance to bring up one last time before being crowned the most powerful man in all of France and, indeed, one of the most powerful men in the world. Upon arriving in the cathedral to thundering applause, the sound of a several hundred person choir, and yet more cannon fire, Napoleon and Joséphine then donned giant, impossibly fuzzy ermine-lined pimp capes weighing some 80 pounds each. At this point walking around required the help of four people for the soon to be emperor, with these individuals trailing Napoleon lest he have to comically lean forward and struggle for every step. As for his wife, Joséphine’s helpers were none other than Napoleon’s sisters, Elisa, Pauline and Caroline- a task they loathed given their dislike of Joséphine, rumored to be because of resenting her grace and sophistication. At one point they reportedly flat out refused to be the empresses’ entourage, but when Napoleon made threats against them if they didn’t, they acquiesced. That said, it is noted that after being crowned, Joséphine attempted to ascend to her throne only to almost fall over backwards when her helpers forwent their duty and remained at the bottom of the steps. It is generally stated that this was an intentional jab at the woman. However, that same thing happened to Napoleon himself when his helpers likewise let him ascend on his own, resulting in him initially miscalculating the effort needed to drag the cape up the steps and almost falling over. So the common rumor that this was an intentional slight at Joséphine is probably incorrect, even if Napoleon’s sisters perhaps enjoyed it either way. Going back to the grand entrance- Napoleon’s walk through the cathedral was accompanied via a carefully orchestrated series of movements from his entourage, all of which was planned out in excruciating detail before hand with dolls and a to-scale drawing of the cathedral. Throughout the coronation, Napoleon stood in his giant cape visibly bored, stifling several yawns and by accounts spending much of his time observing his wife in her diamond encrusted dress instead of the proceedings. Napoleon then shocked the crowd further by snatching the crown before the Pope could put it on his head and instead did it himself. While this is often stated to have also shocked and offended the pope himself, the truth is that every tiny detail of the ceremony had been painstakingly negotiated and planned out, including Napoleon making sure he’d get to crown himself. Thus, the pope was well aware Napoleon was going to do this, contrary to what is often reported. As to why Napoleon wanted this, he thought it important to indicate that he was being crowned Emperor not by the will of the Church, but by his own merits and the will of the French people. Unfortunately for Joséphine, she was unable to get pregnant, which was a big problem for Napoleon who, as he so aptly put, needed an heir. Her inability to provide an heir was somewhat surprising given she’d already given birth to two kids by her previous husband, General Alexandre de Beauharnais, who had been guillotined during the Reign of Terror. Nevertheless, whether because of some complication from her last pregnancy, Napoleon’s Le Petit Caporel not firing enough rounds, or perhaps her age (she was 41 at the time, 6 years Napoleon’s senior) or a combination of all of these, she remained barren as the Gobi. This all resulted in Napoleon having the marriage dissolved about five years later, marrying the sprightly young 18 year old Duchess of Parma, Marie Louise, with the hope that he’d have better luck impregnating her. However, despite while married he and Joséphine having had affairs (including some in which he sired offspring) and him casting her aside, he apparently never lost his affection for his first wife, nor she for him. The former couple frequently wrote one another remarkably intimate letters, with Napoleon still often addressing her as “my love”, writing about everything from day to day matters to seeking council about matters of state. They even visited each other on occasion. As you might imagine, this was much to the chagrin of his very jealous second wife, Marie Louise, who no doubt was well aware that she was only around instead of Joséphine because of her baby making abilities. Amid the numerous felicitations you receive from every corner of Europe…can the feeble voice of a woman reach your ear, and will you deign to listen to her who so often consoled your sorrows and sweetened your pains, now that she speaks to you only of that happiness in which all your wishes are fulfilled! … I can conceive every emotion you must experience, as you divine all that I feel at this moment; and though separated, we are united by that sympathy which survives all events. Meanwhile, it is not possible for me to delay telling you, that more than any one in the world do I rejoice in your joy… I do not suffer, while you are happy; and have but one regret, in not having yet done enough to prove to you how dear you were to me…. While you were only the second spouse of the Emperor, I deemed it becoming to maintain silence toward your Majesty. That reserve, I think, may be laid aside, now that you are become the mother of an heir to the Empire. You might have had some difficulty in crediting the sincerity of her whom perhaps you regarded as a rival; you will give faith to the felicitations of a Frenchwoman, for you have bestowed a son upon France. Your amiableness and sweetness of disposition have gained you the heart of the Emperor – your benevolence merits the blessings of the unfortunate – the birth of a son claims the benedictions of all France. It must be confessed, however, that the Revolution, without corrupting the heart, has greatly extended the intelligence, and rendered the spirits of men more exacting. Under our kings, they were satisfied with repose, now they demand glory. These, Madame, are the two blessings, the foretaste of which you have been called to give to France. She will enjoy them to perfection under your son, if, to the manly virtues of his sire, he join those of his august mother, by which they may be tempered. At one point, Napoleon even brazenly tried to get the two women together, hoping they’d become bosom buddies, presumably allowing him to have Joséphine around on occasion. I wished one day to take [Marie Louise] to Malmaison, but she burst into tears when I made the proposal. She said she did not object to my visiting Joséphine, only she did not wish to know it. But whenever she suspected my intention of going to Malmaison, there was no stratagem which she did not employ for the sake of annoying me. She never left me… Still, however, when I did happen to go, I was sure to encounter a flood of tears and a multitude of contrivances of every kind. Of course, as noted, this didn’t stop Napoleon and Joséphine from incessantly writing to one another. In fact, reportedly unlike many other correspondence, Napoleon nearly always immediately stopped whatever he was doing to tear open any letter from Joséphine immediately upon receiving it, even occasionally interrupting meetings while campaigning to do so. Assuredly, Sire, it was note mere curiosity which led me to desire to meet the King of Rome: I wished to examine his countenance- to hear the sound of his voice, so like your own- to behold you caress a son on whom centre so many hopes,- and to repay him the tenderness which you lavished on my own Eugene. When you recall how dearly you loved mine, you will not be surprised at my affection for the son of another, since he is yours likewise, nor deem either false or exaggerated sentiments which you have so fully experienced in your own heart. The moment I saw you enter, leading the young Napoleon in your hand, was unquestionably, one of the happiest of my life…. Still I am perfectly sensible, Sire, that those meetings which afford me so much pleasure, cannot be frequently renewed, and I must not so far intrude on your compliance as put it often under contribution. Let this sacrifice to your domestic tranquillity be one proof more of my desire to see you happy. …Ah! Sire, why cannot I fly to you! Why cannot I give you the assurance that exile has no terrors save for vulgar minds, and that, far from diminishing a sincere attachment, misfortune imparts to it new force! I have been on the point of quitting France to follow your footsteps, and to consecrate to you the remainder of an existence which you so long embellished. A single motive restrained me, and that you may divine. If I learn that, contrary to all appearance, I am the only one who will fulfill her duty, nothing shall detain me, and I will go to the only place where henceforth there can be happiness for me, since I shall be able to console you when you are there isolated and unfortunate! At least I shall die regretted; I have always desired the happiness of France; I did all in my power to contribute to it; and I can say with truth to all of you now present at my last moments, that the first wife of Napoleon never caused a single tear to flow. “Joséphine” wasn’t actually named that. Her real name was Marie-Josèphe-Rose Tascher de la Pagerie. Before Napoleon, she always went by Rose, but he disliked that name and began calling her Joséphine, a slight variant of “Josèphe”. He was the first to call her that, but as he liked it, for the rest of her life she went by that name. What Did Napoleon’s Wives Think of Each Other?